At a press conference on Friday, US President Donald Trump and other US officials declared that the US "must win" the race in ultra-fast 5G technology and argued the US was well-positioned to win. But that has been met with skepticism and criticism in China. Chinese industry analysts noted that not only did US officials exaggerate the US' capabilities but they also brought geopolitics and its "America first" zero-sum theory into the development of a crucial technology that will have implications for not one country but the entire world for years to come. During the press conference, Trump said "the race to 5G is a race America must win… It's a race that we will win." Citing several reports that said that the US was leading in the race, Ajit Pai, the chairman of the US Federal Communications Commission, remarked that the US "is now well-positioned to win the race to fast, secure and reliable 5G." "At the moment, I think the only advantage the US has is chips," a Beijing-based industry insider, who requested anonymity, told the Global Times on Thursday. "Even that gap is being closed by Chinese firms like Huawei." In terms of equipment manufacturing, the world's top five makers are Huawei, Ericsson, Nokia, ZTE and Samsung. Chinese companies such as Huawei, Lenovo and Xiaomi are also leading in development of 5G mobile devices, the insiders said. In terms of 5G devices production, "China is the dominant player," he said. "So I don't know where their confidence comes from," the insider said. "It sounds more like expressions of worry that it is falling behind." Just over a week before the press conference, the Defense Innovation Board, which is affiliated with the US Department of Defense, released a report that warned about China's advances in 5G and its "security risks" to the US. The report pointed out China will have over 350,000 5G base stations, nearly 10 times as many as in the US, and that Chinese companies such as Huawei and ZTE are pushing 5G development globally and China's handset and internet applications and services are likely to become dominant globally. "Even if [the US] were to restrict use of Chinese equipment suppliers domestically, the United States is not a big enough market in wireless to prevent China's 5G suppliers from continuing to increase market share globally," it concluded. Though some US carriers such as AT&T claimed they had launched 5G or plan to soon, "they are mostly likely just slightly upgrading from 4G and not offering real 5G," said Fu Liang, a veteran analyst in the telecom industry. Fu told the Global Times on Sunday that for technological advances that have as wide implications as 5G does, and are also as complex as 5G, "there is no simply way to say who is leading and who is not. Frankly, from the consumers' standpoint, it's not about who wins but how we can get the best services." What's more concerning, analysts say, with regard to the comments from the US officials is that they politicized the development of 5G technology, which likely to pose unnecessary obstacles for further advancement. 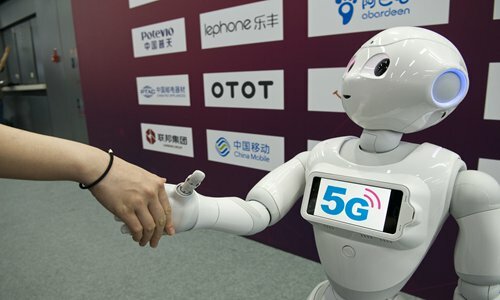 "Putting politics ahead of technology development and markets will no doubt further complicate market competition and largely increase the difficulty of 5G development," said Fang Xingdong, founder of Beijing-based technology think tank ChinaLabs. In what analysts describe the "America first" zero-sum theory in 5G, Trump said that "we cannot allow any other country to out-compete the US in this powerful industry of the future… We just can't let that happen." Fang said that although Trump did not mention China by name, he was clearly aiming at China when describing "rivals." "In facing this 5G race propelled by the US, [China] must enhance its strategic will as well as stay rational and calm," he said.